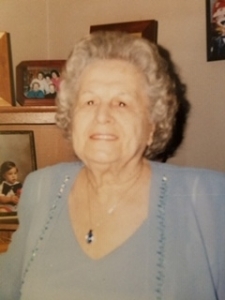 Olga “Elle” Lesko Kranyak, 94, of Boothwyn passed away on January 24th at her home. She was born in Chester to the late Michael and Anne Lesko. Elle was a woman who was dedicated to her home and family. She enjoyed baking, reading, and going to the casino. She was also an avid fan of Philadelphia sports. She was predeceased by her husband, Joseph Kranyak, Sr., and her son, Joseph Kranyak Jr., and six siblings. She is survived by her sons, James (Jennifer), Michael, and John (Tanina); sister, Ruth Sorrentino (Michael); grandchildren, Brian, Aileen (Christopher), Philip (Mary Margaret), Matthew, and Pamela. Her funeral service will be held on Thursday, January 31st at 12pm at the Joseph A. Ward Funeral Home 1459 Market St., Linwood, PA. Friends and family are invited to her viewing on Wednesday evening from 6-8pm and again on Thursday morning from 11am-12pm. Burial will follow in Immaculate Heart of Mary Cemetery. Donations in her name can be made to the Parkinson’s Foundation NCA, 8830 Cameron St. Suite 201 Silver Springs, MD 20910 or to the National MS Society at www.nationalmssociety.org/donate. Sending our deepest sympathy for your loss. At such a time of sadness we hope you know that we care very deeply. My condolences on your loss. God’s blessings. Your Mom was like a 2nd Mom to all the Weindel Gang. As children she brought all of us so much loving & caring. I have so many memories of our families gathering together….Your house, our house, the lake.. Aunt Elle always made me feel like the daughter she never had. I am joyous that she is once again with Uncle Joe, Joey & my Mom & Dad. I believe she is now back in the kitchen cooking & baking for all of us while sitting at the kitchen table chatting with Aunt Kay, the men drinking beer & shots & all eight of us playing together like one big happy family. She was the essence of a wife & Mom. I will be unable to attend her funeral but please know that all my thoughts are with all of you now. May she rest in peace & peace to all of you. I’m brought to quiet tears with your fond and loving rememberance of the two mom’s that were a part of our growing up. After the luncheon, all of the immediate family sat in mom’s living room and read your tribute outloud, as well as the presiding minister also noted your comments during his readings so, you were present with us all….Yes my hope is they’re all somewhere preparing perogies and other refreshments for when we eventually arrive as it was their love to do…… Love Mike.